The South African government is, generally speaking, strongly supportive of breastfeeding. Unfortunately, the labour law is lagging behind: while there are laws that protect breastfeeding mothers, they still have more than enough loopholes and omissions to let your employer off the hook. This post will help you to understand what your rights are as a breastfeeding working woman. 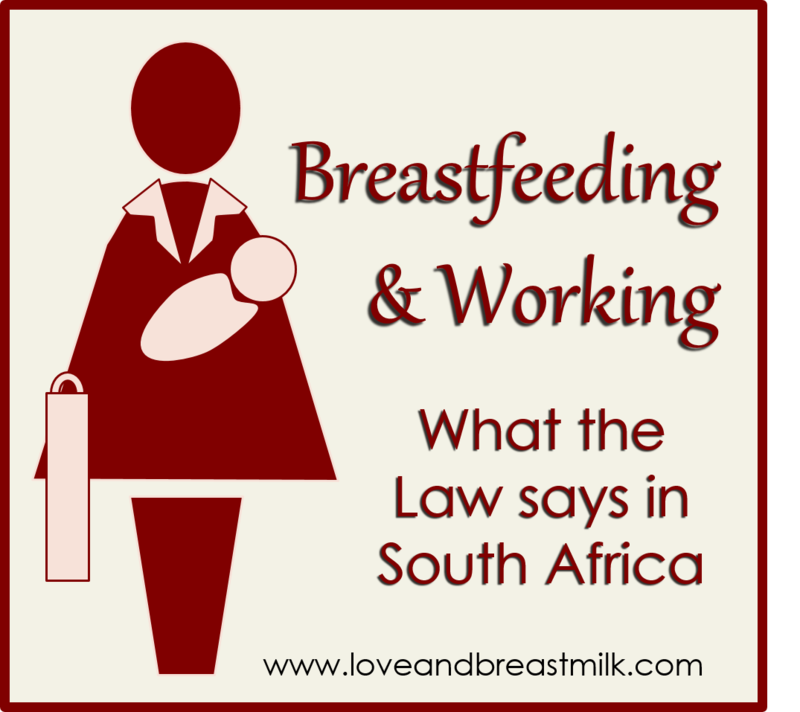 Does the Law protect breastfeeding working women in South Africa? Maternity leave is regulated by the Basic Conditions of Employment Act (you can read about it or download it here). With very few exceptions, all employers must abide by this law. You are entitled to four calendar months of maternity leave (which you can start any time from four weeks before the birth of your baby), but this does not have to be paid. If your employer does not pay you during your maternity leave, you can claim compensation from the Unemployment Insurance Fund (UIF) – you can read more about that here. Your employer may not deny you the full four months of maternity leave, but you may return to work earlier of you wish. However, if you want to go back to work earlier than six weeks after the birth of your baby, you will need the approval of your doctor or midwife. From a breastfeeding point of view, it is obviously best to take your full four months of maternity leave, so that you and baby have plenty of time at home to learn to breastfeed. The Basic Conditions of Employment Act has an addendum called the Code of Good Practice on the Protection of Employees during Pregnancy and After the Birth of a Child (You can download the full document here). 5.13 Arrangements should be made for employees who are breast-feeding to have breaks of 30 minutes twice per day for breast-feeding or expressing milk each working day for the first six months of the child’s life. This means that you are allowed two breaks of 30 minutes each in addition to your usual lunch break and tea breaks. Unfortunately, you are only entitled to these breaks until your baby is 6 months old. In my experience, though, if you continue to perform well at your job, everyone tends to forget about the six month limitation – so if you don’t bring it up, it is very likely that your boss won’t either, and you can carry on expressing for as long as you want/need to. It doesn’t require that your employer give you a suitable space for expressing or for storing your milk. It does not specify whether your breastfeeding breaks are paid or unpaid. There are no penalties for employers who fail to comply; your only recourse would be to take up the matter with your union or other labour representative. Some employers use these loopholes to avoid supporting their breastfeeding employees. But remember: it is a violation of the Basic Conditions of Employment Act for your employer to discriminate against you in any way because you are breastfeeding. If that happens, you should contact your labour union or your nearest branch of the Department of Labour. To make things easier for you, I’ve written a sample letter that you can submit to your employer to help convince them that they need to give you time to pump – you can find it here. Good luck in addressing this matter with your employer! And remember, every conversation you have now is making things easier for all your colleagues who will breastfeed after you. That’s a pretty awesome thing you’re doing there. Want to know more about breastfeeding as a working mom? Check out my e-book, Breast Pumps and Business Suits. It contains absolutely everything you need to know about making a success of breastfeeding and working! Click here for more info. Im currently breastfeeding my baby but my problem is working a late shift while my baby is still young.. am I allowed to ask for a straight shift in this case? Unfortunately, the law doesn’t specify that your employer has to accommodate you, but it can’t hurt to ask.